Indians seem to have outperformed Chinese in terms of their presence in the corporate management world, with more Indians holding CEO positions in large multinational companies in the US such as Google and Microsoft. What's the reason behind this disparity? The Global Times spoke with two businesspeople - one Indian, the other Chinese - to find out. According to them, India's advantages in nurturing talent and in language makes it easier for Indians to adapt to different cultures, while Chinese students who studied in the US prefer to come back to China and focus on the Chinese economy. In recent years, more Indians, including Indian-Americans, have taken up high-level management posts in large multinational corporations in the US compared to Chinese, with India-origin CEOs now leading Google and Microsoft. 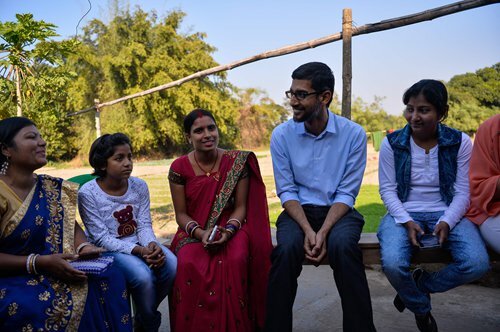 Sundar Pichai, who was born in Tamil Nadu, India, was appointed CEO of Google in August 2015, while Satya Nadella, who was born in Telangana, India, became Microsoft's CEO in 2014. In addition to those two representatives, the CEOs of SanDisk, Adobe Systems, PepsiCo, Harman International and Cognizant are all of Indian origin. By contrast, there are barely any CEOs of large companies in the US who originate from the Chinese mainland. So why are so many Indians becoming CEOs of multinational companies, while businesspeople from the Chinese mainland lag behind? Different from China, MBA degrees have become common for university students in India. "Most of my friends pursued an MBA degree after undergraduate study. The institutions where we did our MBAs were some of the top business schools in India, and then we managed to get jobs with some of the better-known corporations, banks or consulting firms," said Sumeet Chander, country head of global professional services provider Evalueserve. Chander is from India and manages the company's China operations in Shanghai. Generally speaking, holding a bachelor's, master's, especially an MBA, or even a PhD degree in engineering has become standard for CEOs of Indian origin in US high-tech firms. This trend is demonstrated in the profiles of the CEOs of Google, Microsoft, Adobe, SanDisk and many other firms, said Chris Dong, global research director at technology advisory firm IDC China, who is based in both the San Francisco Bay Area and Beijing. Dong, who studied in the US during the 1990s for his master's degree, worked as a software design engineer at Microsoft for more than six years and the director of strategy and operations at Cisco for nearly a decade. "Most Indians at US high-tech firms seem to follow the same career path: They start as an engineer and then manage products. It's crucial for those who wish to pursue high-level management posts, as rotations in different product or business units help one better understand the firm's strategies and operations," Dong said. Take Google's CEO for example. Prior to joining Google in 2004 as a vice president of product management, Pichai worked with the engineering and product management divisions of semiconductor maker Applied Materials Inc, as well as at McKinsey & Co in management consulting. On the contrary, most Chinese engineers prefer to pursue a career on the technical ladder. Aside from Indian businesspeople's strong educational backgrounds, their willingness to adapt and lead also helps them in big global companies, according to experts. "Most of the good students in India tend to be proficient in English, so when they move to the US, Canada or the UK, it's relatively easy for them to adapt," Chander said. "Interestingly, most Chinese prefer to move back to China [in the long run] for work. Also, sometimes language is an issue, especially for first-generation folks who move to the US. So adapting takes longer," he noted. Meanwhile, Indians are more adaptive and more willing to express themselves and get recognition, Dong said. "It's common to see Indian students developing friendships with Americans and those from other countries and regions, while most Chinese students are confined to their small circle." During the 2016-17 academic year, 350,755 Chinese students enrolled in US universities, up 6.8 percent year-on-year, while the number of Indian students grew 12 percent year-on-year to more than 185,000, the fastest recorded growth rate, according to a report released in November 2017 by the Institute of International Education, a nonprofit organization supported by the US government. Another key factor is the recognition of Indian talent by US firms, Dong noted. "Foreign companies are more willing to set up outsourcing centers and research centers in India, which is beneficial for the nurturing of global and high-end talent," Dong said, noting that the R&D investment budgets of US firms in India is generally two or three times that of such budgets in China. In fact, India is a quickly emerging global R&D hub, with around 30 percent of the top 1,000 global R&D spending organizations hosting centers there, according to a report released by the India Brand Equity Fund in June 2017. China's nurturing of innovation talent could be accelerated, if the country is willing to establish a more open market for both local and foreign technology players, such as those in the enterprise software and services sector, especially cloud-based platforms and software service providers, Dong said. He also added that this will enable China to play more competitively in an open market and to share, compete with and utilize best-of-the-breed knowledge and skills. "I do think that there will be a lot more internationally acclaimed CEOs from China in the future, but a lot of them will be working from China and not in the US going forward," Chander told the Global Times. "Most smart Chinese folks would like to focus on the Chinese economy, which is likely to become larger than any other economy in the world."